Toasting the beginning of Spring with some Green! Today felt like Spring in Connecticut and a lot of snow melted, so I’m toasting the day with some green! This savory toast is Canyon Bakehouse Gluten-Free Heritage Style Whole Grain bread topped with roasted broccoli, sautéed garlic slices, ricotta, a drizzle of garlic-infused olive oil and crushed red pepper flakes. Seriously delicious flavor combo! We have been huge fans of Canyon Bakehouse bread for a long time and were lucky to have them send us some of their new Heritage Style bread to try. Their Heritage Style line is larger in size than their other bread and more in keeping with non-gluten-free bread slices. Same great taste and we loved it! 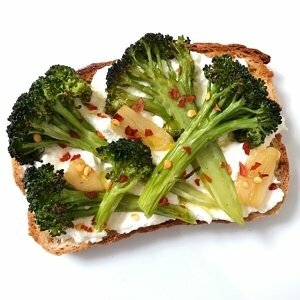 Inspired by Eating Well Magazine, I used ricotta instead of goat cheese and broccoli instead of broccolini because that is what they had in-store today. Toss Broccoli with olive oil, salt and pepper and roast in a pre-heated oven at 450 degrees for approximately 10 minutes. Meanwhile, heat 2 tablespoons olive oil in a small pan over medium-high heat. Add garlic, sliced thin and cook, stirring gently until just golden, about 1 minute. Remove with a slotted spoon to a paper towel-lined plate to drain, reserving the garlic oil. Spread ricotta on gluten-free toast of your choice. Top with some of the roasted broccoli and garlic slices. Drizzle with the reserved garlic oil and/or crushed red pepper, if desired.